Shoot the Moon: Will Hollywood Ever Film a Blockbuster in Space? The entire universe expands when Neil Armstrong steps onto the surface of the moon in First Man. By placing his big honking space boots on the rocky terrain, the astronaut, played with Drive-like stoicism by Ryan Gosling, makes one small step for man and one giant leap for mankind. Director Damien Chazelle, the technical wizard behind La La Land and Whiplash, emphasizes the visceral power of the moment by opening up the imagery's scope to the full IMAX aspect ratio, filling up the entire screen with the gray stretch of ground. It's stunning, poetic, and super, super fake. As First Man's screenwriter Josh Singer explained when the movie was released back in October, the moon sequence was shot in a quarry in Atlanta, the low-gravity effects achieved using wires and balloons. Pure Hollywood hokum. The film earned strong reviews from critics and appreciative words from Armstrong's sons ahead of its debut. But First Man underperformed at the box office, grossing less than $50 million domestically, and it failed to receive any Oscar nominations in non-technical categories. (Heading into the awards season, it was considered a Best Picture favorite.) Analysts pointed to the movie's long runtime, its somber tone, and even the insipid controversy about the visibility of the American flag as possible reasons for its financial struggles. With audiences and the Academy, the movie failed to connect. 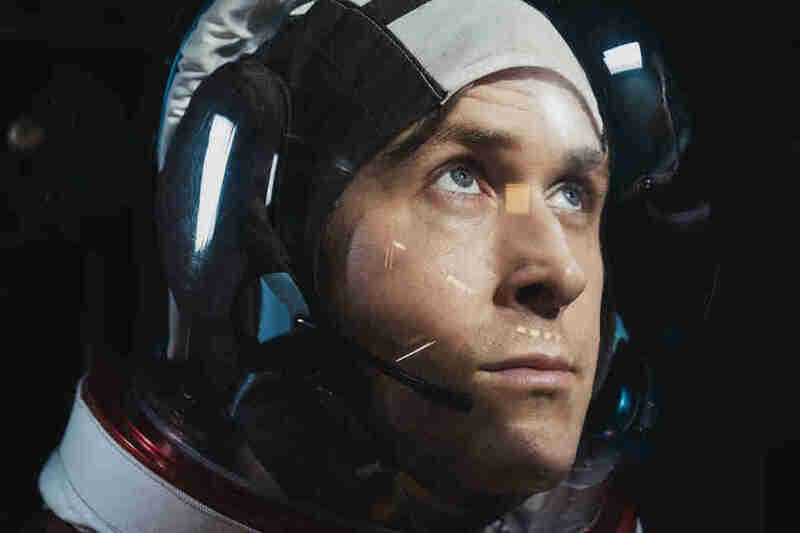 Here's a proposal no one has suggested: They should have sent Ryan Gosling to the actual moon. Spurred by the success of blockbusters like Alfonso Cuarón's Gravity, Christopher Nolan's Interstellar, and Ridley Scott's The Martian, the "auteur space movie" has become a reliable sub-genre for studios, but it's an increasingly crowded field. This year, A24 will unleash Claire Denis' sexually-charged arthouse space-thriller High Life, starring Robert Pattinson, and 20th Century Fox will fire up James Gray's father-son space epic Ad Astra, starring Brad Pitt; streaming services have also gotten in on the action with shows like Hulu's (now canceled) Sean Penn-goes-to-Mars drama The First and Apple's upcoming For All Mankind, which comes from Battlestar Galactica producer Ronald D. Moore and imagines an alternate history where the space race never ended. The fear of space-movie burnout feels justified. What better way to stand out -- and prove your filmmaking bona fides -- than to send a fresh-faced movie star into orbit? Is shooting a studio movie in space a science-fiction fantasy or a near-future inevitability? Could a narrative Hollywood feature, one with professional actors and an experienced crew, ever film in space? "I think so," says Terry Virts, a former NASA astronaut and veteran of two space flights, when I pose the question to him. "The CG has come along way, and, frankly, it's usually cheaper to do CG. But at least as of 2018, real is better than computer. You can tell." To be clear, Apogee of Fear is a brief, often awkward experiment. You can watch it on YouTube and enjoy its silly plot about solving a mysterious oxygen crisis aboard the space station, its amateur acting and can-do spirit. No one would mistake it with a big budget project like Gravity, Interstellar, or First Man; it's more offbeat than a mainstream film project. In Man on a Mission, you also see Garriott painting during his astral travels. "I'm creating the very first zero-gravity art," he tells the camera. Garriott's handmade enthusiast sensibility does point to a truth about space travel and filmmaking: Even at the extreme costs of commercial space travel, the innovators will likely be scrappy eccentrics and risk-taking oddballs. The major leaps in production design and special effects in Hollywood filmmaking about space travel have often come from artists obsessed with verisimilitude. That never-ending quest for outer space authenticity often drives filmmakers to extremes, but the results can transport you to the humming interior of a shuttle or the unnerving stillness of floating in the dark void. After seeing Stanley Kubrick's meticulously designed 2001: A Space Odyssey in 1968, Soviet astronaut Alexey Leonov, who became the first human to walk in space in 1965, famously declared, "Now I feel I’ve been in space twice." 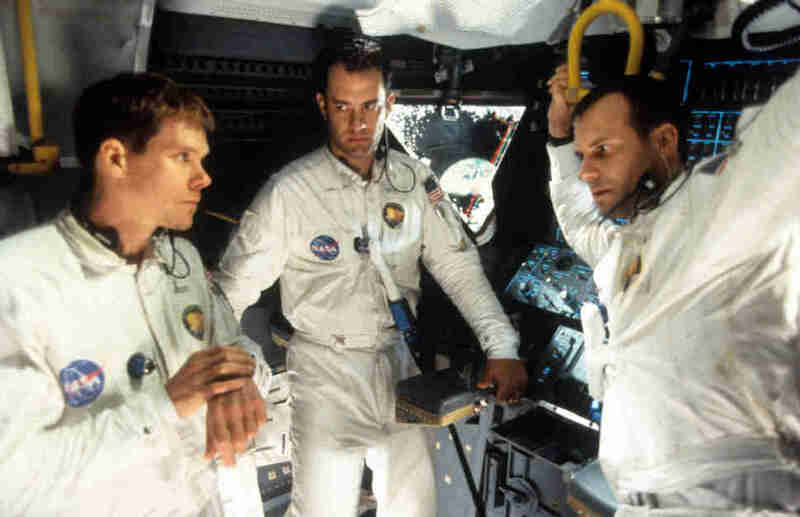 In order to achieve its memorable zero-gravity sequences, Ron Howard shot scenes for his '90s space-disaster drama Apollo 13 aboard NASA's KC-135 plane (AKA the "vomit comet"). Beyond exploring the ocean floor and the imaginary world of the Na'vi, James Cameron has discussed wanting to shoot on an International Space Station. Before he left the project, Colin Trevorrow said he wanted to shoot space footage for Star Wars: Episode IX. Just like with the space race, being first is important. Truthfully, there are plenty of other films that have been shot in space, but they're documentaries with an educational bent produced by resource-rich studios like Disney or IMAX, with assistance from NASA. 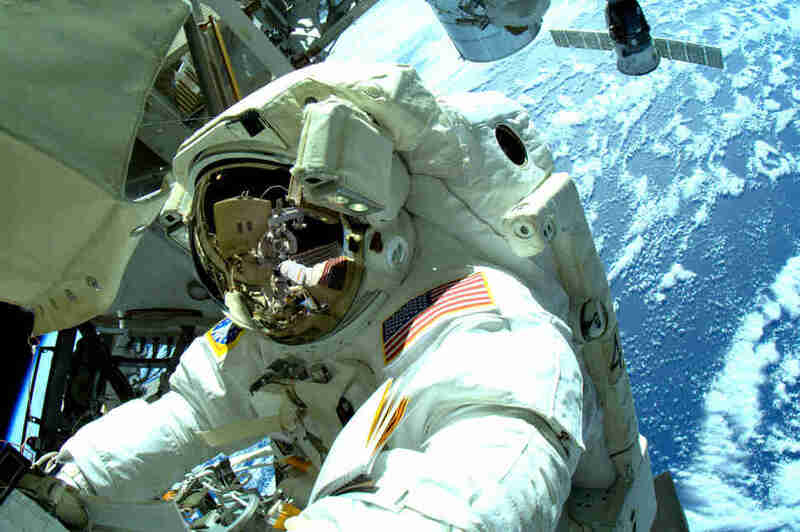 As part of their official training, astronauts learn basic photography skills -- concepts like exposure, aperture, shutter speed, ISO, focus range, the rule of thirds -- but the crew members who work on the IMAX films receive more rigorous training. Even then, it's often only 25 hours total. Cinematographer James Neihouse, a veteran of large-format filmmaking who got his start helping IMAX co-founder Graeme Ferguson shoot underwater documentaries, runs these cinema bootcamps. Astronauts need to know everything about shooting IMAX because they're going to assume every role in the filmmaking process: When they get up in space, they're the actors, directors, sound and lighting technicians, cinematographers, grips, and the best boys. Shooting a movie on Earth is already absurdly complicated, and going to space is even more complicated. Combining the two processes is an immense logistical, technical, and bureaucratic challenge, especially if you don't have your own private rocket-ship in your backyard. "As long as NASA has purview over the space missions, I can pretty much tell you the answer is going to be no," says Marsha Ivins, a former NASA astronaut and veteran of five space missions, when asked the space-movie question. "Because that's not what NASA's funded space program is about. It's about science." In addition to being a human encyclopedia of space travel and photography knowledge, Ivins shot on IMAX film in space and more recently served as the liaison between NASA and the film crew for A Beautiful Planet, a 2016 documentary filmed aboard the International Space Station and the first IMAX space doc to use digital cameras as opposed to the bulkier film cameras. (The movie's director Toni Myers also helmed IMAX projects like 2002's Space Station 3D and 2010's Hubble.) On the older projects she worked on, Ivins remembers filming with an IMAX camera the size of "a small refrigerator" and using spools of film that were "the diameter of your steering wheel." Getting those antiquated cameras onboard was an uphill battle. As Ivins explains to me over the phone, the first astronauts, like the crew-cut sporting, Air Force-trained pilots you meet in First Man, were not obsessing over the type of camera they would pack for their missions. Given the stakes, it's not surprising that the limited available space on a shuttle is fraught and political: Would you rather have extra food or photography equipment? NASA's history of still photography in the Apollo era states that when John Glenn became the first American to go into orbit, the mere idea of bringing a camera was "an afterthought." Growing up with a darkroom in her house, Ivins was interested in photography long before she got to NASA. "I was developing pictures from as early I could stand on the stool and reach the sink," she says. When she arrived at the office in 1984, she had to fight to convince the larger engineering community that imagery was an important part of their jobs. "It's the only thing you bring back to the taxpayer, truly," she explains, still irked that her colleagues were less enthusiastic about documenting their travels. "If you look at all of the people who have flown in space, there are probably two dozen that are really interested in photography. Not a lot." As one would imagine, there are specific aesthetic and technical challenges to capturing great footage in space. For one thing, your body and your equipment are literally floating. "You have to figure out how to brace yourself to take a shot," explains Ivins. "Wrap your leg around something, slide your toe into a toe loop thing that we've got all over the vehicle, curl up around something, wedge in a corner, or stick the camera on a bracket and shoot it that way. There's a whole other layer of eliminating motion in just a regular snap that you don't have to do when you're on the ground." According to Neihouse, the key to turning an astronaut into an IMAX auteur is getting them to understand how the size of the screen affects the images. During the training, he has his students shoot on IMAX film, get it processed, and then watch the print of their home movies on the giant screen. "They were quick to learn that their mistakes were huge," he recalls with a laugh. "Even if the mistakes are small, they're really big on the big screen." 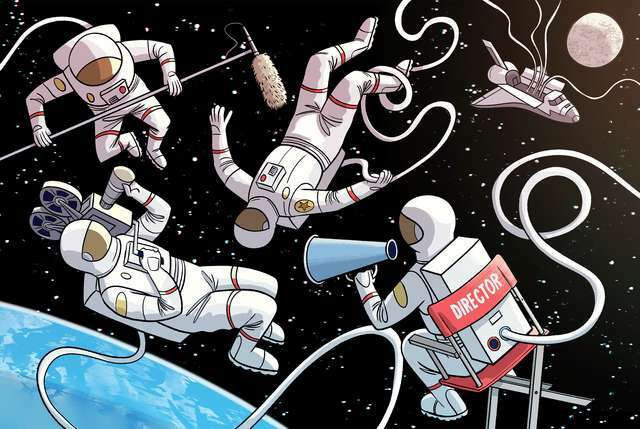 The experts I spoke with who have actually shot movies in space were in agreement that the major hurdles to a commercial narrative feature shooting in orbit wouldn't involve the camera equipment. Presumably, if you had a killer idea, you could film the whole thing using a GoPro and it would look slick, competent, and professional. Getting to space is the real problem. Despite the amount of press generated around companies like Elon Musk's SpaceX and Jeff Bezos's Blue Origin, the prospect of affordable, safe commercial space travel, the type where a film crew could charter an adventure to the stars together, remains in the distant future. 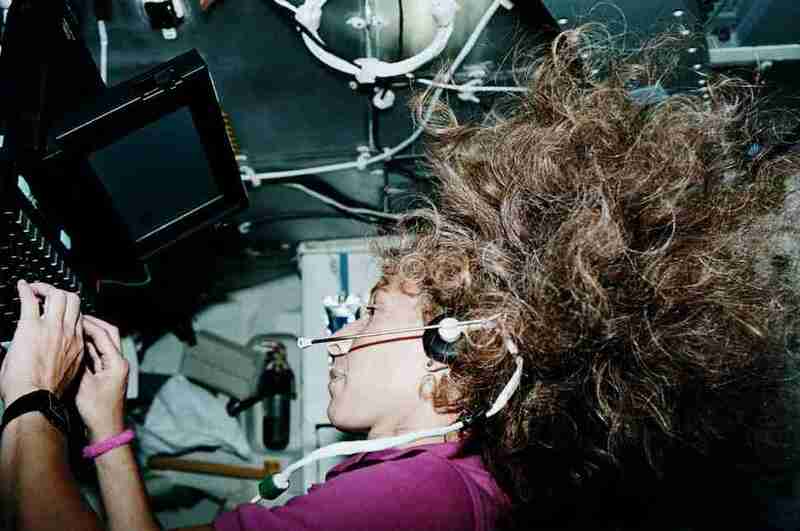 As Neihouse says, "Space flight is really, really, really hard." There are innovators hoping to make it easier. For studio space, Terry Virts imagines a project like Robert Bigelow's private space habitats could serve as a place for a film crew to shoot a feature. But training astronauts to shoot an IMAX documentary is simpler than training even a determined actor to be a highly skilled, knowledgeable astronaut. There's no storming back to your trailer in space if something doesn't go right. "When the alarm goes off, you're putting the fire out," Virts says. "When the toilet breaks, you're fixing it. When your crew mate's tooth filling comes out, you have to replace it." Even if a film could conceivably get around all the logistical and financial hurdles, including securing multi-million dollar tickets for every member of the crew, there'd still be another wrinkle: those pesky insurance costs. Even a student film requires insurance, and the potential risk of moving a Hollywood production into orbit is difficult to calculate. According to Dylan Reiff, a producer and account executive at Reiff & Associates who specializes in brokering insurance for entertainment projects, it wouldn't be impossible to insure a short scene shot in space. It would probably be treated like a stunt -- one where the personnel would be in great danger for a sustained period of time -- but including an actor would make it extremely, perhaps prohibitively, expensive. "Just the mere fact of getting that much equipment and people up into space would be cost prohibitive in my mind," says Reiff. "Usually when you do a feature film, there are 20 to 30 people on set and there's a lot of people involved. They'd have to just bring the director and the DP and the talent they were filming." Assuming commercial space travel becomes more viable in the next 100 years -- and we're not limited by whatever becomes of Trump's ill-defined Space Force -- it's more likely that the first commercially released narrative feature shot in space will resemble a clever conceptual gambit like The Blair Witch Project rather than a more spectacle-driven science-fiction story like Prometheus or Alien: Covenant. The limitations will force artists who can get to space to find creative solutions. Where does that leave the rest of us on Earth? Space isn't only an inspiration for filmmakers and eccentric rich people; audiences also clearly want to journey into the great beyond. Whether it's to escape growing ecological anxieties on Earth, to explore the far reaches of the universe, or simply stare in slack-jawed (and, sure, maybe stoned) awe at the wonders of creation, humans still yearn for and seek out the mystery of the cosmos. Like Buzz Lightyear, we want to go to infinity and beyond. It's not only a high-brow thing either. Both of Hollywood's most over-the-top action extravaganzas -- the Mission: Impossible series and the Fast and the Furious franchise -- have inspired fans to imagine the ludicrous, physics-defying stunts in outer space. (Cruise was even asked about the possibility in red carpet interviews.) Why not let Vin Diesel ride a Nos-powered rocket to the moon? You know Cruise, who reportedly wanted to shoot a narrative film in space with James Cameron in the early '00s, is itching to prove he's got the right stuff. After First Man, we already know Ryan Gosling looks great in a space suit. Ever the optimist, astronaut Terry Virts thinks he would make a good space movie star if called upon. He may not be Matt Damon, but he's ready. If a studio executive decides to go a different route, he's also happy to assist in building a future where IMF agent Ethan Hunt is reborn as a Star Child. "I would love to go shoot Tom Cruise in space," he says. "I really would. That would be awesome."